In recognition of Black History Month, this February we are spotlighting a unique digital repository of video oral histories that captures an admirable depth and variety of African American heritage. 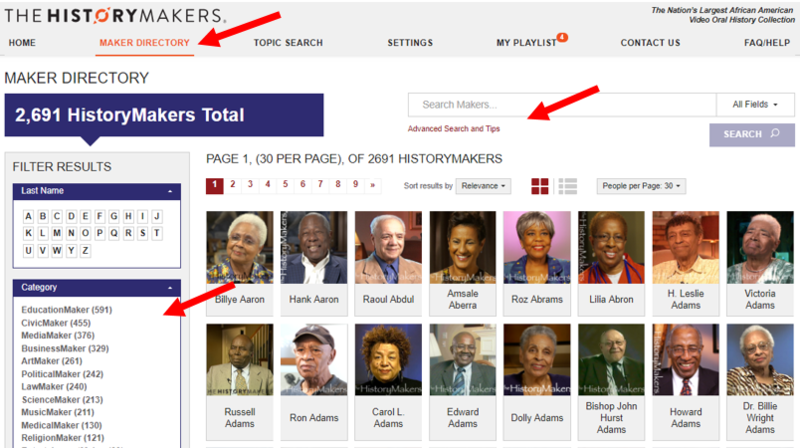 Billed as “The Nation’s Largest African American Video Oral History Collection,” the HistoryMakers Digital Archive is a veritable treasure trove produced by The HistoryMakers organization, a non-profit educational institution that is “committed to preserving and making widely accessible the untold personal stories of both well-known and unsung African Americans. Through the media and a series of user-friendly products, services and events, The HistoryMakers enlightens, entertains and educates the public, helping to refashion a more inclusive record of American history,” as stated in the HistoryMakers mission statement. The holdings are already vast: 148,163 stories assembled from interviews with 2,691 historically significant African Americans as of February 21, 2019, to be precise. Because of the incredible scope of this project, with interviewees from all different backgrounds, fields, and accomplishments, it is an extraordinary undertaking. Recollections from the participants date back to the 1890s, spanning many landmark moments in modern Black history: the founding of the NAACP in Chicago (1909), issuance of the Brown v. Board of Education decision (1954), the Civil Rights Movement of the 1950-60s, and the election of our first African American President Barack Obama. However the histories collected here do not focus solely on one’s memories of a particular event or time; rather, individuals are interviewed about their entire life. This richness of context gives us a special view into how this amazing person emerged as the success he or she is today. Interviews began in 1993 and continue today. 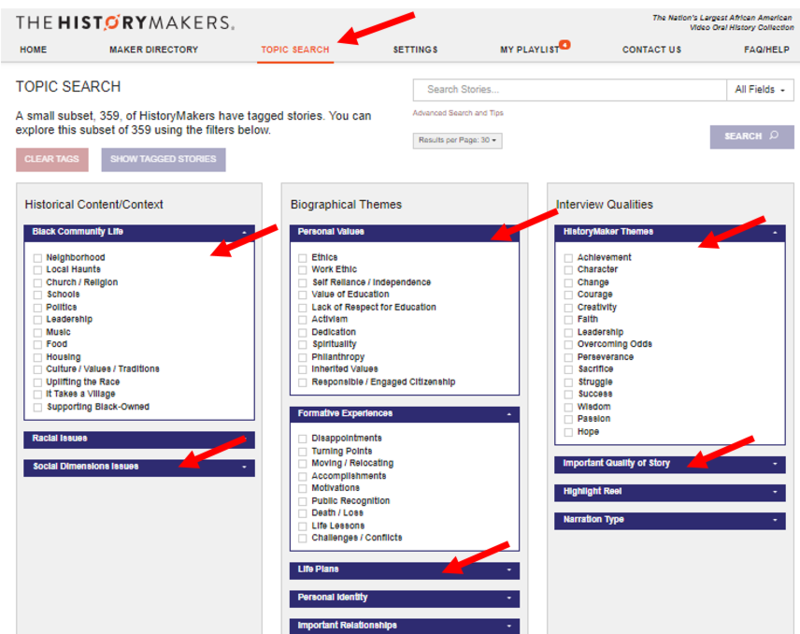 HistoryMakers Born This Day is an interesting rotating feature of the homepage, and from there you can dive into the content in two ways: browse the Maker Directory, or search. Click the Maker Directory tab and you can use the filters on the left pane to filter by name, category, gender, decade of birth, or job type. From this page you can also run a biography search, or a search about the men and women interviewed. Full interviews are broken down in a series of smaller videos called stories. Individuals have landing pages where all of their stories and biographical information is compiled. Compare Barack Obama’s landing page with his story about being a community organizer in Chicago. This is important to note because it affects your search results. Clicking into the ‘Advanced Search’ under the search bar from this page displays the fields you can choose to search: Accession, biography, description, first name, last name, preferred name, and occupations. The stories search combs through what these men and women were talking about in their interviews, as opposed to their biographical information, and is accessed from the home page. The stories are tagged so they can be found through designated categories: Historical Content/Context, Biographical Themes, Interview Qualities. These categories expand into subsets so you can find people based on topics, but a surprisingly low number of stories (only 359) have been tagged, which is a shame because the range of available tags is varied and would be very helpful discovery tool. Stories without tags will not be shown in the search results. Two other features I want to point out is the ability to build a playlist and adjust playback settings. Videos can be added to your playlist from the search results (by hovering over the video thumbnail and clicking the plus sign) or from the detailed page of a video by clicking “Add to Playlist.” When a video has been added to your playlist, the thumbnail image becomes grayed out so it is a clear visual cue as to what videos have already been added. Remove a video by hovering over the thumbnail of an added video and clicking the X that will appear. All of these features can also be managed under the MyPlaylist tab, which displays the current number of items on the list as you’re browsing. Under the ‘Settings’ tab you can customize your viewing options so videos will automatically play as soon as they load and advance to the next story from the same person when the video ends. These settings also apply to your playlist, and will remain until you deselect them. I recommend leaving them unchecked for searching, then check both once you have your selected list of stories and want to sit back and watch for a longer period of time. Finally, as you’re exploring the volumes African American histories, use the “Title my playlist to save/share” link on the ‘My Playlist’ tab to share your curated playlist. For questions about ILL, please contact the Law Circulation Desk at lawcirculation@northwestern.edu. If you’ve used Westlaw this semester, you’ve likely noticed some major changes, or perhaps thought you’d accessed the wrong database! 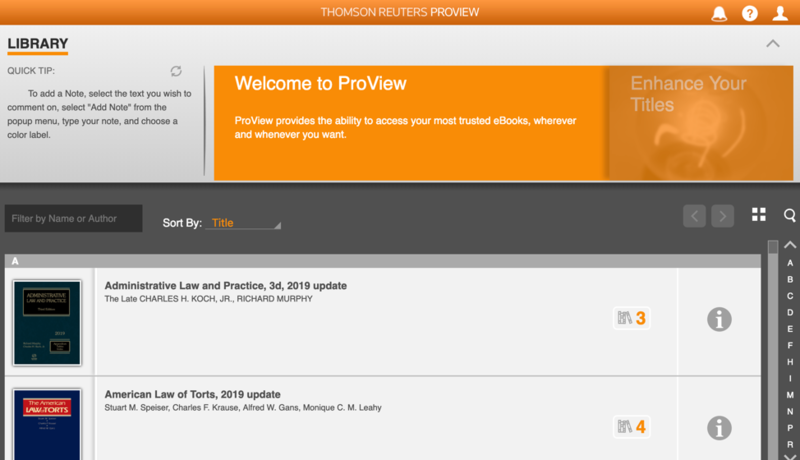 Indeed, as of January 2019, all law students now have access to Westlaw Edge, the latest iteration of Thomson Reuters’ Westlaw platform. 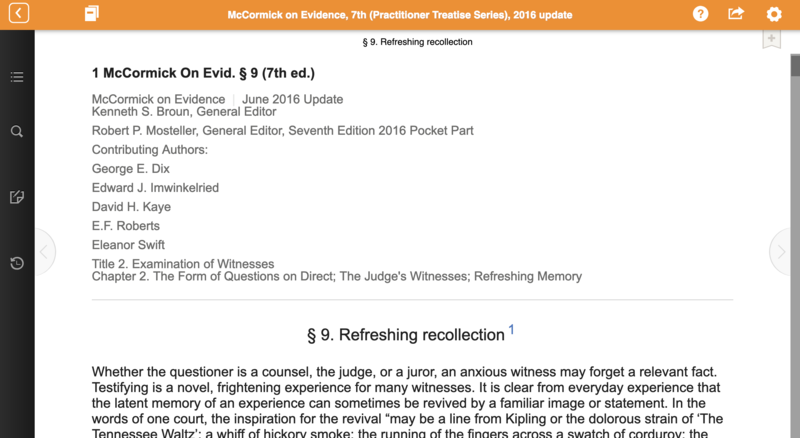 Rest assured, the basic functionality and organization of Westlaw has stayed the same, so you won’t need to learn a new way of doing research. That being said, though, a few new features are worth noting, each of which results from the system’s increased use of artificial intelligence. WestSearch Plus. This feature allows you to begin typing your terms or area of law into the universal search box and receive suggested search queries and secondary sources. In the screenshot below, for example, typing “employment discrimination” into the search box results in suggested searches such as “What is pretext in employment discrimination?” For a brief video overview of this feature, visit: https://youtu.be/SNkzvViOUYw. KeyCite Overruling Risk. Up to this point in time, Keycite flags have only applied to the case you’re viewing, not the underlying cited authorities. So, for example, even if the case you’re viewing has not been explicitly reversed or overruled, it may be relying on one or more cases that are no longer good law. KeyCite Overruling Risk addresses this by assigning a new treatment symbol to cases relying upon reversed or overruled authority–an orange circle with a white triangle containing an exclamation point. For a brief video overview of this feature, visit: https://youtu.be/Nbw0a5zmIGo. Statutes Compare. Statutory sections and regulations on Westlaw now include a “Compare Versions” button above the text. This feature allows you to quickly review how the text of a statute or regulation has changed over time. For a brief video overview of this feature, visit: https://youtu.be/kDl7vOxJqDM. Litigation Analytics. The largest addition to the platform in terms of content is “Litigation Analytics,” which allows you to gain granular insights into courts, judges, attorneys, law firms, and case types. Using this feature, you can investigate questions such as “How often does my judge grant motions to dismiss?” or “What types of litigation does a law firm handle?” For a video overview of this feature, visit: https://youtu.be/_i9ySuGplpc. If you have any questions about these new features or anything else research-related, just ask a librarian. We’re happy to help! Subscript Law is a free nonprofit legal news website that provides summaries of Supreme Court cases featuring easy to understand infographics. Subscript Law contains summaries of cases from the courts October 2017 and 2018 terms, as well as explainers for selected historical cases and legal concepts. For example, see the explainer and infographic for last term’s case, Abbott v. Perez. The case had a complex procedural history, which Subscript breaks down in the argument section of the case’s overview. It provides additional context by acknowledging the other gerrymandering cases before the court last term and linking to the explainers on Gill v. Whitford, Benisek v. Lamone and a general overview of political gerrymandering. If you are interested in receiving updates about new Supreme Court explainers and infographics as they are released, you can sign up to receive Subscript Law’s free email newsletter or follow them on Twitter.